Take part in an exciting fundraising challenge. 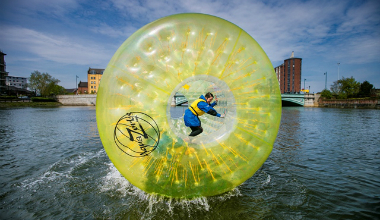 Zorb up the River Lagan in a bubble on Sunday 12 March 2017 and raise vital funds for Bowel Cancer UK. Each team of two or four will have their own zorb bubble. You will battle it out against the clock and the team with the most number of rotations wins. No previous experience is required, and with parental permission you can be as young as eight to take part, and commit to raise £50 for Bowel Cancer UK, the UK’s leading bowel cancer research charity. Bowel cancer is the second most common cancer in Northern Ireland, with 440 people dying each year of the disease and nearly 1,100 people diagnosed. However bowel cancer is treatable and curable especially if diagnosed early. Nearly everyone diagnosed at the earliest stage will survive bowel cancer but this drops significantly as the disease develops.